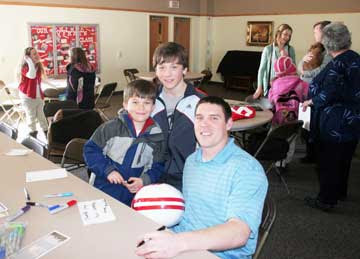 New York Jet and Tony, Wisconsin native Jim Leonhard accepted an invitation from Fr. John Anderson to speak to the elementary students at St. Mary's Catholic School. Anderson was the parish priest at St. Anthony's Church in Tony when Leonard was a boy, and the two have remained good friends ever since. Leonhard fielded kids' questions as adeptly as he had the numerous punts on the football field. Many questions dealt with whether or not he played with Brett Favre (he didn't), while others were concerned with his two dogs wandering among the delighted children. He stressed to the students that they should stay active and have fun in sports. Leonhard added that one should not be afraid to lose or fail. "Learn from the experience... that is the biggest thing." 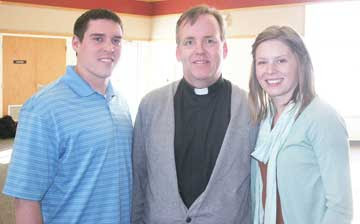 In this photo, Jim and his wife Katie are seen with Father John Anderson. 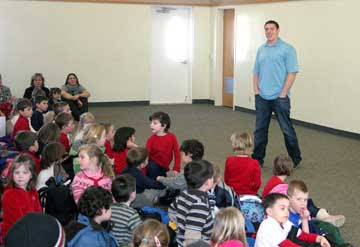 Jim Leonhard talks to the kids at St. Mary's. Leonhard signs some stuff for the Kaminski boys. 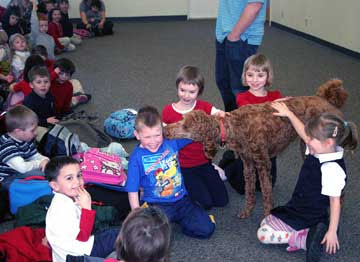 Jim Leonhard's canine answers a question during his visit to St. Mary's.